line and a description of deck fittings later in this chapter. Rat guards are hinged conical metal shields secured around mooring lines. They are used to prevent rats from coming aboard ship. The bowline and forward spring lines prevent the ship from drifting astern. The stern line and after spring lines prevent the ship from drifting forward. Look at figure 7-5. Here, lines 1, 3, and 5 are called forward lines; lines 2, 4, and 6 are called after lines. When secured, these lines tend to breast the ship in. The forward and after spring lines are used to prevent the ship from drifting forward or aft. NOTE The various types of line and wire rope are discussed in the Marlinespike Seamanship section of this chapter. Teamwork is essential in carrying out the mooring operation. Lines must not be kinked or fouled. Keep control of the lines and avoid dipping them into the water. Remember, observe all safety precautions! If the ship is to remain moored for a long period, lines are doubled up and bound together with marline hitches, and rat guards are placed on each line. Look at figure 7-6. To provide protection to the side of the ship while it is alongside a pier, camels (large wooden logs or rectangular structures) (views B and C) are often placed between the pier and the ship. Fenders (large cylindrical objects of rubber or fibrous material) (views A and D) are swung over the side of the ship to give bumper support against damage whenever a ship lies alongside another ship or a pier. 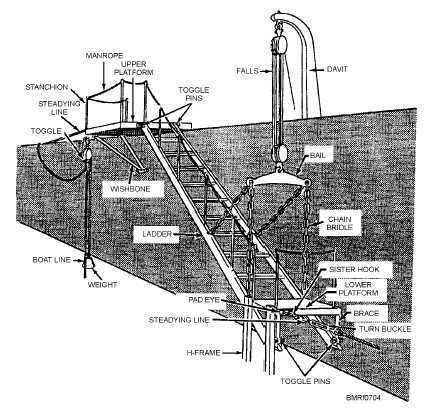 7-4 Student Notes: Figure 7-4.A rigged accommodation ladder. Figure 7-5.Ships mooring lines.